First Time Mama - First Time Blogger: Happy Father's Day to my Husband! Happy Father's Day to my awesome husband Brian! It is his 2nd father's day - but I feel that this Father's day might be even a little better for him. He has had a full year to experience being a father and is doing quite the incredible job at being Julianna's Daddy. I love him more than any words can ever express. I love seeing him interact with Julianna and taking care of her. It makes me smile and warms my heart. Here is the post I wrote for last Father's Day. It's about being a Super Dad. It's worth another read. It's one of my favorite posts I have written! :) Enjoy. Dads are the best!! 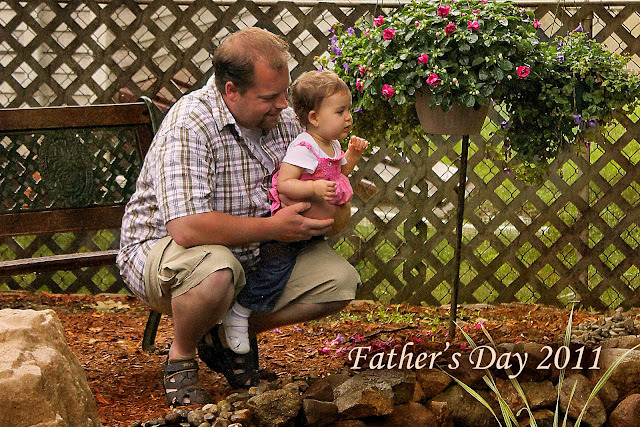 What sweet ideas you had for gifts for him for Father's Day! Love that picture! Happy Father's Day to Julianna's Daddy! I hope you guys had a great Father's Day! That is an adorable picture of Julianna and her Daddy!